Edie & Arnold - Island Residents in the boating community for 20 Years. FOR SALE - 51 Fairview Blvd. FOR SALE - 331 Jefferson Ct.
FOR SALE - 5 Fairview Blvd. FOR SALE - 227 Albatross St. Please enter your info below and we will contact you asap! Property listings are updated daily! List, Sell & Buy Real Estate! Please give us a call if YOUR LOOKING TO SELL your property! 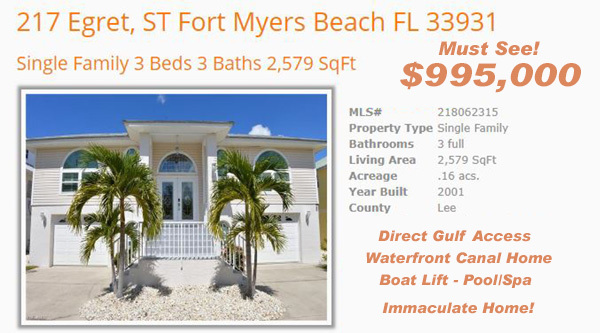 Fort Myers Beach Real Estate Listings updated DAILY! Homes and Condos for sale. 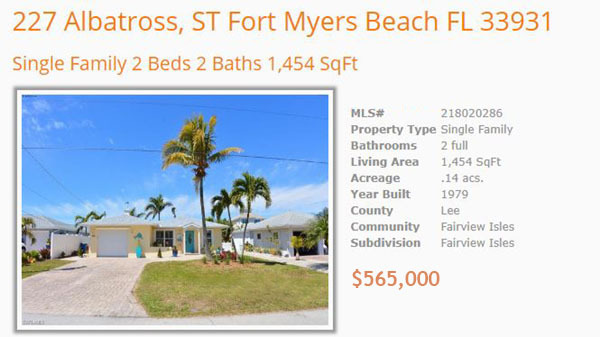 Real Estate listings for houses and condos, serving Fort Myers Beach, Bonita Springs, Cape Coral, Ft. Myers including Lee & Collier counties. 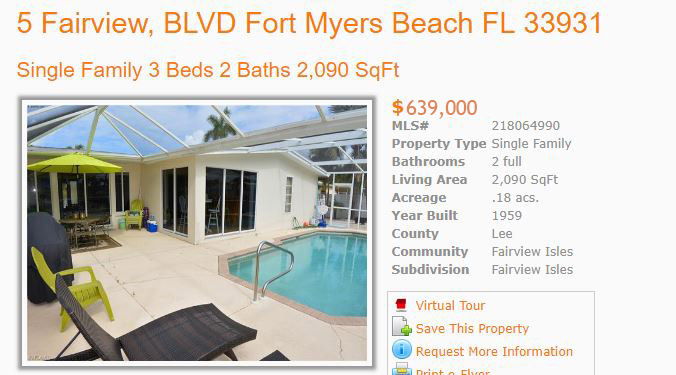 Click on the beach condo links posted here to view condominiums listed for sale that allow pets. Each property has certain pet regulations regarding the number of pets allowed, and size the of pets that are allowed in these pet friendly condominiums. Investment Condominiums available. Weekly and Daily rentals! One of the most preferred locations on the island. 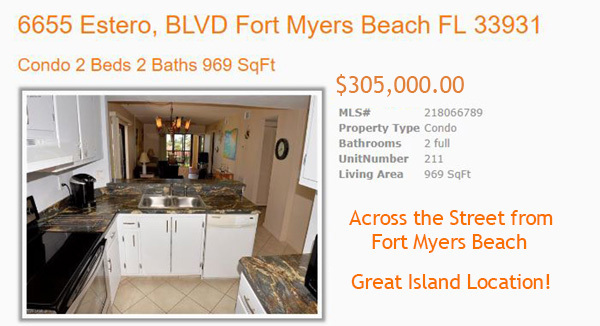 Rare Gulf Front corner unit with wrap around lanai with over 1500 square foot of air conditioned living space. The lanai has wind rated sliding doors in front of the screens that you can adjust to your preference. In addition, this unit has an underbuilding parking garage and extra storage. This is the unit buyers have been waiting for. Completely updated floor plan, new crown molding, paint, tile, more closet space, granite counters, appliances, plumbing. All done for you to enjoy this season. 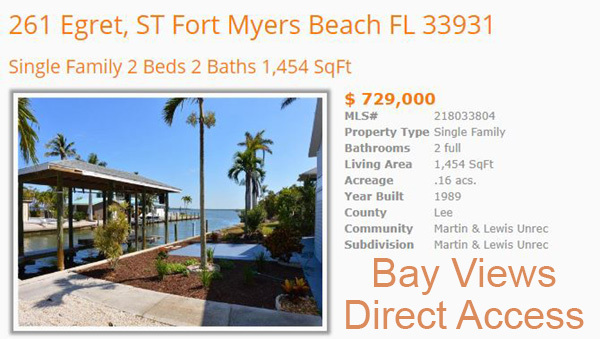 Fort Myers Real Estate News and Property trends in the Fort Myers and Lee County Area from the Mausser Team at Lahaina Realty. Listings updated DAILY! Homes and Condos for sale. Real Estate listings for houses and condos. The Mausser Team at Lahaina Realty are full time agents on Estero Island. Check your spelling, we know that surfers on the internet spell myers like Meyers often. It is spelled Ft. Myers or Fort Myers. Kick back and breathe the clean gulf air, relax on the beach, soak up the sunshine and just take in all the natural surroundings of our awesome island. A true piece of heaven. Our Island area is one of Florida's top rated resort areas, surrounded by gulf waters and miles of wildlife areas, offering beautiful scenery, and pure serenity. While Estero Island boasts numerous residential and resort developments, Fort Myers Beach still holds its natural character and Key West Style charm. The official deadline for filing for Homestead or other exemptions for tax year was March 1. Late filed applications will be accepted at the Property Appraiser's Office after this deadline and reviewed to determine your eligibility for the appropriate tax year. You may late file your homestead or portability application after the March 1 timely filing deadline by mail or in person. In order to qualify, your Florida Driver's License and Lee County Voter Registration ID # (or Domicile) must be issued to you no later than April 1. These documents must show the residence address as your homestead address in order to qualify. Late filed applications will be accepted up to 25 days after the mailing of the Truth in Millage Notice (TRIM Notice) and will be approved in accordance with Florida law in accordance with statutory requirements and deadlines. If you believe you qualify, do not hesitate to submit your application by mail or in person. For additional information, contact the Property Appraiser's Office. 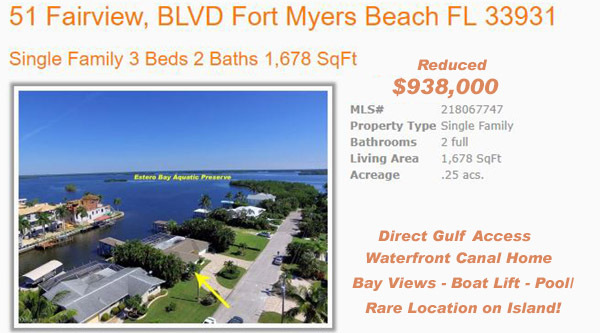 Ft. Myers Beach Waterfront Real Estate Listings updated daily. 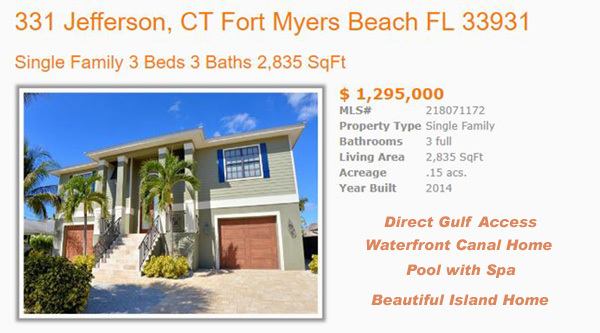 Search Gulf front properties including all Condos for sale and Homes for sale. It is hard to believe that two weeks ago we made settlement on our condo in Royal Pelican. Mary & I couldn't be happier with the purchase. The unit is taking shape nicely as our new Florida home. I mention all of this as a prelude to acknowledging & thanking you for your efforts to make this dream a reality. From the moment we first met you less than a month ago, we were impressed with your professionalism & empathy. Not only did you promptly & professionally return all calls, texts & emails, you initiated most contacts with helpful ideas & suggestions. Plus you have a very positive, engaging personality. As I mentioned in one of our conversations the agent who sold one of our homes up North was very good. However, she pales by comparison to you. I believe I told you that I teach, write & speak on customer service. See my website (www.rjgeorge.com) for details. In fact, I prefer the term delight versus service. My definition of delight is exceeding expectations. You certainly did that. 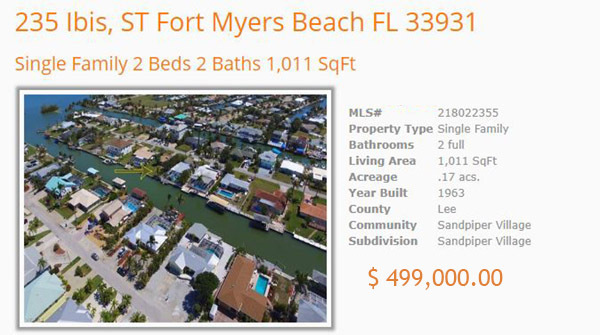 We don't anticipate calling you to list this property for a long time, however, I will recommend you to anyone looking for a home on Fort Myers Beach. You are the best!